If you’re just joining the story of A Gift from Oregon, you can read Part 1 here. While in Uganda I got to spend a lot of time with Denis riding on the back of his boda and visiting his village, Bungatira. He became my closest Ugandan friend which meant I got to see him when he was happy, when he was annoyed with me (which was hilarious), when he was grateful, when he was inspired and when he was sad, but I’d never seen his nervous side. That is, I’d never seen his nervous side until the day we went to his new school. I’d heard about his plans to return to school for weeks on end, heard all the questions he was going to ask the admissions counselor, heard him vacillate back and forth between studying to become a doctor or a teacher. School was all he could talk about since the day he picked up his new pigs courtesy of my friends, Julie and Clark. This talk was kicked into high gear when Jenna and her posse of Oregon Vigilantes, bequeathed Denis enough money to return to school that very term while his pigs matured enough to breed and sell for the next term’s fees. All his talk of returning to school was endearing. There aren’t free public schools in Uganda. Only the well off get to send their children to school. That sentence catches like rocks in my throat each time I write or speak it. Denis’ parents had done their best to raise and sell crops so he could attend school, but the money ran out before the third term of his Senior Three year, the equivalent of the third term of his sophomore year in high school. And he was on his face desperate to return to school. Can you imagine returning to your high school courses at the age of 27? Neither can I. Friends, that takes moxie I simply don’t have. Denis signs up for school. So Denis had every right to be nervous and as he pulled the boda onto the school compound, he was quiet. I had my camera at the ready, knowing that he might be too nervous to remember the details of the day, but that it was a day so worthy of remembering. We entered the modest handmade brick building that serves as the office. The administrator was working inside and she welcomed us as we entered. We sat in front of her desk and to my surprise, Denis asked her none of the questions he’d mentioned to me on the boda. He sat quietly in the chair and twisted his hands, fidgeting and barely making eye contact. I began to ask questions on his behalf, voicing all the things he’d wondered aloud on our daily rides. The administrator gave Denis the registration form and he fumbled with it, his hands visibly shaking. “Yes. I’ll fill it out right now,” Denis removed a pen from his pocket. I watched as he wrote every word and letter with precise care. I talked to the administrator while Denis filled the form out and I was delighted to find out that the administrator was once a primary teacher. I shared with her that I’m a primary teacher in the U.S. and we had a lovely chat. “Alicia, will you take a look?” Denis passed me his registration form. I scanned the facts of his life. His age. His family name. His tribe. His birthdate. The name of his last school. So much information about my friend and at the same time so very little. “Looks good, Denis, but you have to fill out the back as well,” I said quietly turning the paper over and passing it back to him. “The back?” If it were physically possible, I think Denis would’ve blushed. He took the paper and read the backside, carefully filling in more spaces. “Are you his sponsor?” the administrator asked me. “Yes, he’s my boda driver and we’ve become friends.” I smiled at Denis and snapped his photo as he filled out the registration paper. “Can I put your name here?” Denis pointed to a place on the form for names of people likely to visit him at school. He’d listed his mother and one of his brothers. There was one more line. “Definitely. I’d love to visit you at school when I return.” Denis wrote my name. The form also asked for the relationship. Denis penned the words ‘best friend’. I smiled knowing I was in good company with his best friend J.B. and his other best friend, my oldest son, William. Denis completed the form and we left the school under a drizzling sky that couldn’t begin to dampen my mood. I snapped a final photo of Denis standing outside the doorway, his school name emblazoned above the door. A couple of days later he returned to school with the requisite passport sized photo and his enrollment fee, courtesy of my beloved Oregon Vigilantes. On my last evening in Uganda, I sat in a hotel room near the airport and all the way across the country from my loved ones in Gulu. My phone rang and on the other end was Denis calling to tell me he’d used some of the money from the Oregon Vigilantes to sign up for additional tutoring before the term started and also to buy books and a school uniform, the requisite attire for all schools in Uganda. The new term begins in a matter of days and after years of waiting and working and praying and hoping for a second chance to go to school, my dear friend Denis is a student once again. And it’s all because some recklessly kind Oregon Vigilantes saw Denis’ potential from halfway around the world and decided to do something about it. “They came back to Bungatira after I took you home,” Denis sits across the cafe table from me with his hands folded. “They really walked back to Bungatira in the dark to tell you that?” I’m incredulous. “Yes. And I promise we will change,” Denis holds my gaze. “I already have pigs. What other good news could there be?” he laughs. “Yes,” Denis nods. He knows better than anyone because he’s helped me haul pigs and shoes and mattresses and medicine and a wild assortment of other things. “This is my friend Jenna,” I show Denis a photo of her on my iPad. “Jenna and her friends in Oregon sent over a large sum of money, so large that Jenna and I weren’t exactly sure what to do with it. So we’ve been praying about how to best use this money. You know that some of my loved ones have mental illnesses, but what you don’t know is that Jenna’s son, who was a soldier in Afghanistan, has returned home from war and has also been struggling with post traumatic stress. Here he is with his newborn son,” I flick to a new photo on the iPad. “I’m sorry,” Denis’ forehead is creased with worry. I open my travel notebook to the page where I’ve scrawled 250,000 shillings, the equivalent of $100. It’s enough to pay for schooling for the upcoming trimester as well as part of the next trimester. On a good day driving his boda Denis makes approximately $6, not enough to live off, let alone pay for school. I take the shillings out of my purse and slide them across the table to him. He counts them in disbelief. “Thank you, Alicia. This is all because of you.” Denis comes around to my side of the table to hug me. “Will you go with me to register for school?” Denis grins from ear to ear and I do, too. He’s 27 and he’ll be returning to what is the equivalent of third trimester of his sophomore year in high school. “It will be my pleasure.” I use a napkin to wipe my eyes. “I might become a doctor instead of a teacher,” Denis dreams out loud. “I think that would be great. Doctors are teachers, too, you know.” We sit for a moment with that dream between us on the table. “But wait, Denis, I have more good news. Jenna and her friends sent money for Bungatira so your group could start up the savings and loan program you’ve been talking about. People in Bungatira will be able to take out loans to send their kids to school. Here’s how much Jenna and her friends want to give your community group. I slide the notebook over again and point at the number I’ve written. 640,000 shillings, approximately $250 dollars. Denis is out of his chair again and we’re hugging and laughing and crying and making a complete scene in the cafe. “I know my last visit to Bungatira wasn’t easy for, well, anyone, but I’d like to return and tell the group about Jenna and her son and tell them that the changes they’re making are inspiring people halfway across the world. The other thing I’d like to do is return next year and see all the good Bungatira is doing with the money. Is that okay?” I’m hesitant about asking to return. “Denis, you know I’m from California,” I laugh because this is a fact he’s known for over a year. “Sorry, I don’t understand the question.” I’m lost in translation a LOT in Uganda. “I’d like that even more.” My cheeks ache from smiling, but I can’t help smiling at my friend who gets to go back to school. I can’t help but smile for my sweet friend, Jenna, and her fellow Vigilantes of Kindness who have made this possible. Denis leaves me alone in the cafe and I sit thinking about how blessed I am to return to this land and to this people I love so dearly. My mom can verify that all nine pounds, one ounce of me was born in California, but sitting in my favorite cafe in Gulu, I know with every beat of my heart that this-this beautiful work of being kind for the sake of kindness-this is why I was born. I love this kid for wanting to earn money instead of asking for a handout. Ivan is one of my favorite kids from this year. A few years ago Ivan and his younger sister were taken in by an American couple. Ivan didn’t have a father in his life and after a tragic accident his mother was left mentally disabled and unable to care for her children. She now lives in a care facility in another part of Uganda. Ivan calls the American couple his parents. When his parents had to return to the U.S., they left Ivan and his sister with a house to live in. His parents send money for the house, for bills, for food and for schooling. Ivan keeps a detailed account of the expenses and he reports it back to his parents every month. Any extra things Ivan needs, he pays for himself by selling paintings out of the art studio at his house. When Ivan and his sister finish school here, they will join their parents in the U.S., where Ivan hopes to attend a university and major in art. “I’d love to buy a painting, Ivan. Do you have them here?” It matters little to me if his paintings are any good. He brings the paintings to school and we go behind one of the classrooms where he lays them out on the ground. They’re good. I immediately know exactly which one I’m going to buy for myself. It’s a small painting of the word LOVE with Africa in place of the O. What Ivan doesn’t know is that I’m using Vigilante money to buy the other two remaining paintings. “Three? Really?” His Goofy chuckle rolls up from his belly. Ivan takes a few minutes to think. “Is 200,000 shillings okay?” I do some quick converting in my head. He’s asking for roughly eighty American dollars. I pull shillings out of my wallet for the smaller painting and use Vigilante shillings for the other two paintings. We shake hands and both of us leave feeling like we got the better deal. In even more exciting news, after seeing my LOVE painting another friend in Africa is commissioning Ivan to paint a similar one for her. My sister is also going to help Ivan make and sell prints of his paintings. Again, one small act of Vigilante Kindness snowballed into something even greater. When I bought Ivan’s other two paintings I honestly didn’t know what I was going to do with them. I just knew that I wanted to support Ivan and his budding art career. Later in my hotel room as I spread the paintings out on my bed, an idea came to me: I’d give them away to my fellow Vigilantes of Kindness. The only problem-and it’s an incredibly good problem-is that I only have two paintings and I’ve got way more than two Vigilante donors. The two paintings up for grabs are the two closest to the love painting. One is a vertical tree painting. The other is a landscape with elephants in the foreground. I’ll take better photos when I get home. So here’s how it’s going to work, for every dollar you donated, you’ll get a ticket in the drawing. So if you donated $20, you’ll have 20 tickets in the drawing. If you donated $200, then your name will be on 200 tickets and so forth. I’ll do the drawing on September 30th. That will give me time to take photos for making prints. This is also good news for those of you who wanted to be Vigilantes of Kindness, but weren’t able to because you offered to donate when I was already making my way back home. You can make a donation and be entered in the drawing as well. (Message me for details on how to donate.) 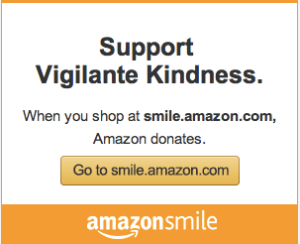 Any new donations will go toward my return trip next year and the Vigilante Acts of Kindness that are yet to come. I’m absolutely giddy at the mere thought of returning to the land I love and exacting more kindness for the sake of being kind. I look at Ivan’s LOVE painting and wonder just what’s going to happen next in my love story-our love story-for Uganda. Sometimes committing Vigilante Acts of Kindness in Gulu involved really glamorous things, the kinds of things that look good in photos, like buying shiny new shoes for 30 kids or wrestling a manure filled sack of piglets on the back of a boda. Like I said, really glamorous stuff. I spent an entire day in Gulu town with the head teacher JB and my trusty sidekick, Denis, making sure some of those basic needs were met. The first item on our list was to buy fencing materials. The boys dorm on campus backs up to a road and JB had been losing sleep at night because the road provided the perfect opening for trespassers, of both the animal and human type, to enter campus. “So let’s go buy a fence, JB,” I shrugged. After a few quick calculations, JB shows me a number. It’s sizable, roughly one hundred fifty American dollars, a small fortune here in Uganda. “I didn’t include the truck,” he scrawls another number and shows it to me. A truck rental will be 40,000 shillings, or roughly sixteen American dollars. We purchased over 50 textbooks. “Well, the primary kids need readers and some workbooks. And teachers need pencils, pencil sharpeners, markers and chart paper.” JB waits for me to say no, but with a wad of Vigilante shillings stuffed in my purse, my mouth is full of yes. School supply shopping is so much more fun on a motorcycle. Mama is all smiles when I ask her to make me a list. She doesn’t hold back and I love her for being so candid about the needs of the students. On the day we hit town to pick up all these things, I love Mama even more for adding yeast infection kits to her list. Watching Denis turn thirty shades of red while he translated that one to the pharmacist was worth ever shilling! How do you say ‘yeast infection’ in Acholi? On my last day at the school, Mama found me and invited me into her living quarters at the far end of one of the girls dorms. “Hi, Mama. Itye maber? (How are you? )” I sit in the plastic chair she’s brought out for me. “I’m fine. Thank you for buying medicine for the students. Five girls have already made use of the feminine medicines.” She sits down across from me. “Mama, you already thanked me. Three times. I’m glad the medicine is helping.” I pat her hand. I don’t really know how to take that one. Different like the kid who eats paste kind of different? Sometimes compliments here are hard to swallow, like how being called fat is a good thing because it symbolizes wealth. “Thanks, Mama. It’s a lesson I’m still learning with lots of help from the people at home.” I look down at my hands. Mama’s right, I am different. I’m different than the person I was when I arrived. I’ve tried to heed Ernesto Sirolli’s wonderful, if not eloquent, advice to ask what people need and then shut up and do it. No more planting tomatoes for hippos. “Greet the people at home and tell them thank you for me,” Mama hugs me tight. She’s soft and I see why the kids have such deep love for her. I leave campus that day knowing that I’m leaving my kids in good hands. I’m leaving them in hands that daily commit magnificently ordinary acts of kindness without fanfare or fuss. I’m leaving my kids in Mama’s hands. This year I was present for Election Day at school. There was a page worth of candidates on the ballot running for different student offices. Each candidate had a couple of minutes to deliver their campaign speech to the 300 members of the student body. Before the speeches began, one of the English teachers stood and spoke about the procedures. He encouraged the students to listen carefully and then to vote with their hearts. The speeches began and during the speeches the students were asked to submit their questions to the student Parliament running the proceedings. There were many coveted offices like Head Boy and Head Girl, each in charge of overseeing their assigned gender and assisting with any problems they’re having which they may not feel comfortable immediately bringing to the adults. One of the most coveted offices is that of Time Keeper. Time Keeper rings the bell to indicate that class sessions are over, that lunch is over, that the school day is concluding, that church is beginning. It is a big responsibility and not one to be taken lightly. There were several candidates for Time Keeper and each gave an excellent speech, but there was one who stood out to me above the rest. Crispus is an S1 (8th grade), student. He’s a tiny kid, about as big as an American third or fourth grader. What he lacks in stature, he makes up for in personality. When Crispus began his speech, I actually jumped at the sound of his voice, so loud and full of enthusiasm. He proclaimed that he is responsible and owns a good watch which would allow him to ensure that classes ended and lunch began on time. The crowd, which had been boisterous throughout the whole assembly now became more vocal than ever. Tiny Crispus stood, shoulders back, taking it all and never responding in turn, waiting for the student Parliament to gather questions from the audience and read them to him to answer. The heckling continued until suddenly the audience began to turn in his favor. Those who had opposed Crispus could be heard no longer over the din that arose. First there was clapping, followed by stomping of feet and then a roar erupted from the crowd. They shouted his name and cheered for him. So loud was their cheering that the student Parliament couldn’t contain them and Crispus couldn’t contain his grin, which had spread from one side of his face to the other. After returning to his seat, Crispus continued to smile for the rest of the proceedings. I imagine he went to bed smiling. “A road you don’t know? I never thought that would happen.” I poke Denis in the back. We speed to the back side of town, curling in between traffic and pedestrians along the muddy road. I’m going to miss riding on the back of motorcycles. I tip my face to the sky and let the sprinkling rain hit my cheeks. My favorite artist, Omuny, is in residence and she has new pieces hanging all over the walls. She’s been busy since last summer. Behind the counter is a stack of paintings leaning against the wall. “Yes. I just haven’t put them out yet.” Omuny motions me behind the counter and I flip thorough the stack. The moment I see it, I know it’s the one for my artist sister. Supporting a local artist is the perfect way to spend the rest of her Vigilante donation. “I’ll take this one, please.” I hand it to Omuny who removes it from the frame and rolls it for me. I carefully count out bills and I squeeze them tight in my hand. She hands me the painting and I shove the wad of bills in her hand, practically running out the door. I grab Denis’ sleeve and pull him out with me. “Quickly, quickly let’s go!” I can barely control my giggles. We speed away and from the back of the boda I see Omuny hurrying out the door toward us. “How much did you pay for that?” Denis calls back to me. “Did you barter with her?” Denis wrinkles his brow. “It’s so much worse than you think.” I turn and wave at Omuny. She waves back and smiles. “Tell me.” Denis is stern now. “You’re doing things all wrong.” He shakes his head at me, like he so often does. “I know.” I can’t suppress my grin. Back in my hotel room I unroll the painting. I take a snap and giggle at the thought of Omuny counting out the money and finding I’d paid double the asking price. I AM doing things all wrong this trip and my heart feels so completely right.